Cut avocados in half and remove the pits. Slice about ¼ inch thick and sprinkle with lime juice; set aside. With a knife remove skin and white membrane from grapefruit. Remove individual sections and transfer to a small bowl; set aside. 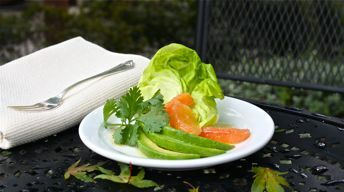 Place butter lettuce leaves on a serving platter or bowl. Creatively arrange avocados and pink grapefruit sections on top of lettuce. Drizzle with dressing.